Arcane. Limited to 1,000 copies signed by Barker @ $200.00. 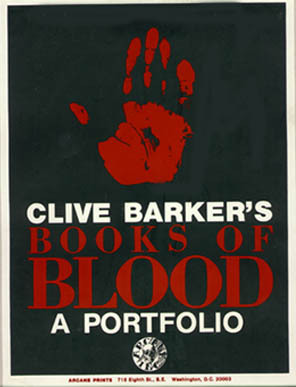 Contains lithographs of the six Books of Blood covers (each individually signed by Clive) plus a seventh print [(also signed)] in a custom cover. 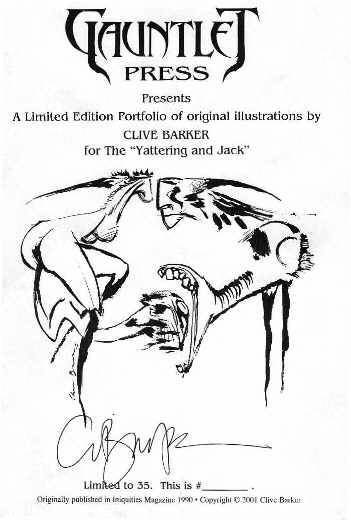 Iniquities magazine produced, in a custom envelope, a limited edition of 200 copies of the illustrations done by Barker for the appearance of The Yattering And Jack in their 1990 magazine. In 2001, Gauntlet Press produced 35 limited and signed copies of the portfolio in a newly designed custom enevelope. Bess Cutler Gallery. Limited to 500 sets signed by Barker on the cover print depicting all 12 images @ $250.00. Contains the summary print and 11 separate prints in a custom cover (which has the 12th image).